February 2015 Royalston Community School, Royalston, MA. Akash and Teddy doing a role play about how students can report bullying to their teachers, principal, guidance counselor, school nurse and parents/guardians. Mrs. Schwab, Guidance Counselor, has been teaching the Steps to Respect to 3rd, 4th, 5th and 6th grade classes at Royalston Community School for the past few months. 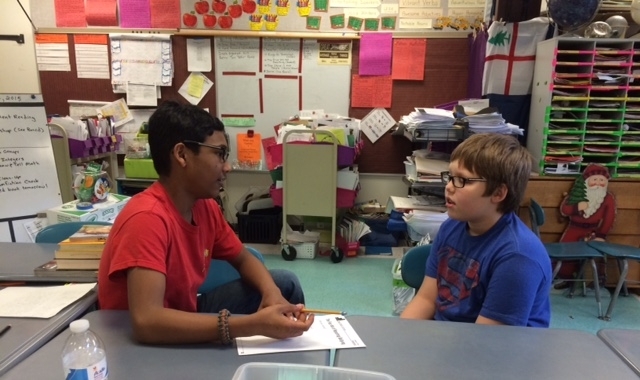 Recently, Mr. Snell’s 6th Grade class learned how to report possible bullying problems to teachers and school staff during role plays in Mrs. Schwab’s classroom lessons. Brian and Jack doing a role play on Steps to Respect bullying prevention skills. Mr. Snell’s 6th Grade students learned and role played how to tell two to three teachers and school staff, and their parents the “what happened, who, where, when,” of possible bullying incidents. Jack, pictured in the first row on the right, is role playing a teacher. Brian is pretending to be an active bystander or target in the role play. Students also learned that sometimes problems between students are peer conflicts, not bullying. The principal is the person who investigates concerns about bullying, and determines if incidents are bullying, peer conflicts, or some other kind of behavior issue. Students at Royalston Community School are kind and caring, and these types of incidents are very rare. The 6th graders had fun playing the roles of teacher, or principal, and bystander or target in the role plays.